Martial arts biopic sequel, to 2008's 'IP MAN' and 2010's 'IP MAN 2'. All three films chronicle the life of legendary grandmaster Yip Man (also known as Ip Man); who is famous for introducing the martial art Wing Chun, to China (and the world). This installment was once again directed by Wilson Yip (who also helmed both other movies); and it was written by Edmond Wong, Tai-Li Chan and Lai-yin Leung (Wong and Chan also co-wrote the first two flicks). Donnie Yen also returns to play the title role (for the third time). The movie also features Jin Zhang, Lynn Hung, Mike Tyson and Kwok-Kwan Chan (as Bruce Lee). Chan also played Lee in the 2008 TV series 'THE LEGEND OF BRUCE LEE', and a 2010 film (of the same name). 'IP MAN 3' is definitely not as good as it's predecessor (which many consider even better than the original film), but it is a fun martial arts flick. The story, this time, deals with a ruthless American property developer, named Frank (Tyson); who's trying to gain control of a Hong Kong school, in 1959, that Ip Man's son attends. Ip (Yen), of course, comes to the school's defense. He also must deal with his wife (Hung) becoming ill, with stomach cancer, and a new Wing Chun grandmaster challenger (Zhang). A young martial arts student, named Bruce Lee (Chan), also wants Ip to train him. The movie has some pretty impressive martial arts fight scenes; I also especially enjoyed the battle between Donnie Yen and Mike Tyson. Tyson actually makes a good menacing villain; considering he didn't have to say much (that was a very wise move, of the filmmakers). 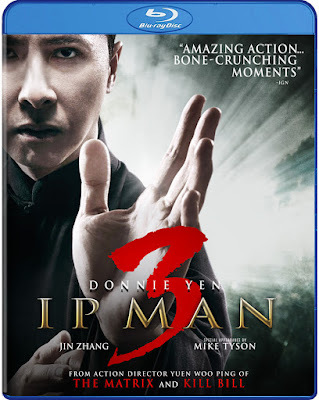 Other than the action, the movie doesn't have a lot to offer; I don't feel like I actually learned much about Ip Man, and the story is kind of a mess. 'IP MAN 2' is a much better movie, but this one isn't bad.